Preheat air fryer to 400°. In a shallow bowl, whisk eggs. In another shallow bowl, mix cheese, wheat germ and seasonings. Trim ends of eggplant; cut eggplant lengthwise into 1/2-in.-thick slices. Cut slices lengthwise into 1/2-in. strips. Dip eggplant in eggs, then coat with cheese mixture. Spritz eggplant and air fryer basket with cooking spray. 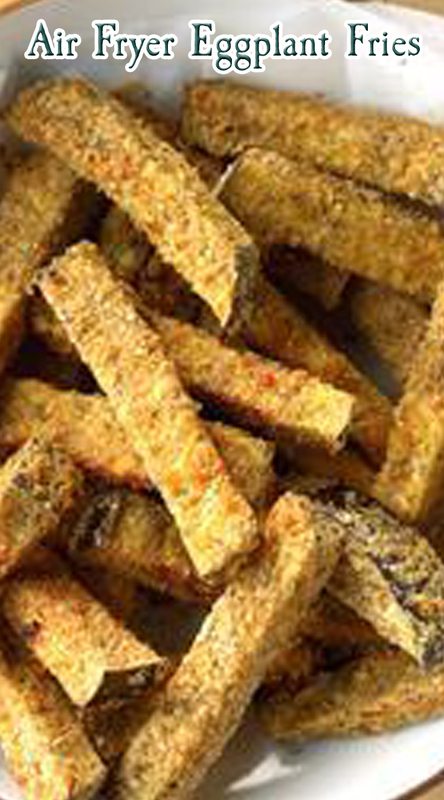 Working in batches if needed, place eggplant in a single layer in air fryer basket and cook until golden brown, 5-7 minutes. Turn eggplant; spritz with additional cooking spray. Continue cooking until golden brown, 4-5 minutes. Serve immediately with pasta dipping sauce.